I’ve been breaking out the slow cooker almost every day over the past few weeks. If I owned multiple slow cookers, I would have slow cooked our entire Christmas dinner. The only challenge that I have with the slow cooker is how to twist my favorite recipes into a “light” version in an effort to lose these last ten pounds of baby weight. Beef, potatoes, rice, white beans, and the other heavy hitters that I usually throw in the crock pot laugh in the face of smart eating. But this past weekend I tried a quick and easy recipe that my husband declared a “keeper”, and it uses my favorite lean meat: grilled chicken! Is your mouth-watering yet? Hold tight and let me mention a few awesome things about this recipe. Instead of using beef, this recipe utilizes chicken. 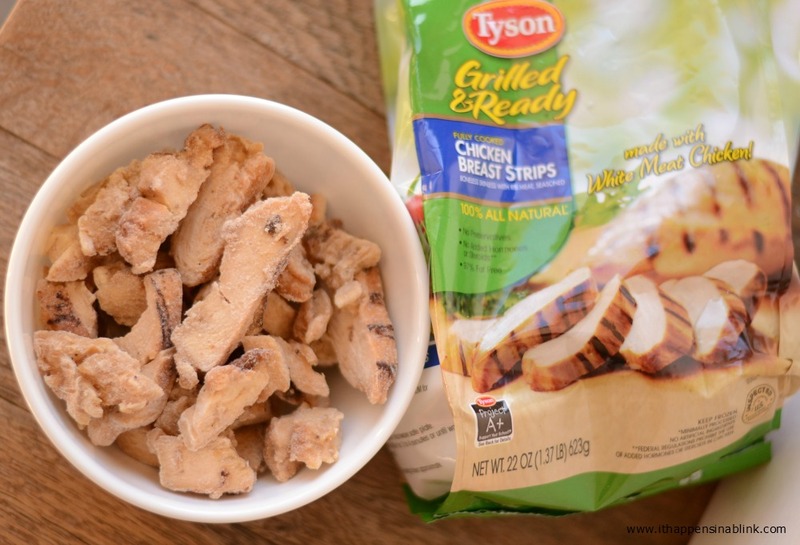 I’ve taken the “quick and easy” to the next level by using frozen Tyson Grilled & Ready Chicken Strips. In addition to making the meal more healthy and lean by eliminating beef, the frozen chicken strips can be thrown right into the slow cooker! I don’t like having to pre-cook anything for my slow cooker recipes (after all, the point of the slow cooker is to not have to cook, right? 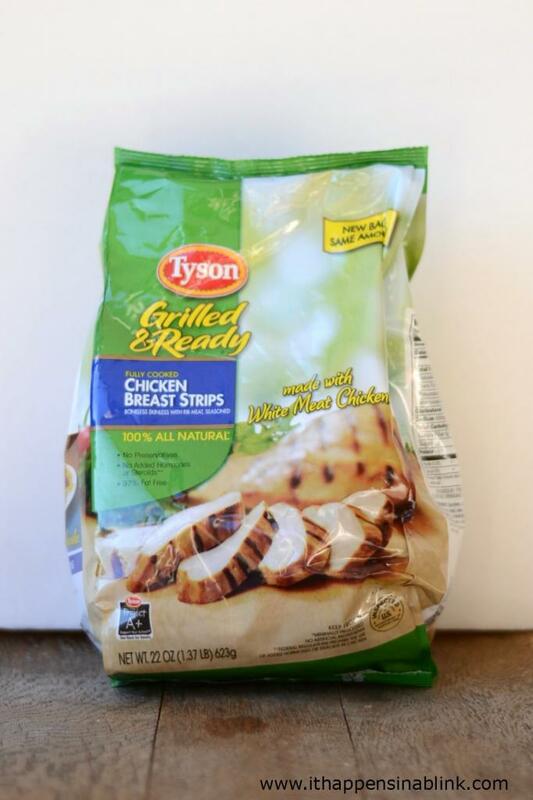 ), so the Tyson Grilled & Ready Chicken products are the perfect solution. I purchased the Tyson Grilled & Ready Chicken Strips at my local Walmart in the frozen food section. 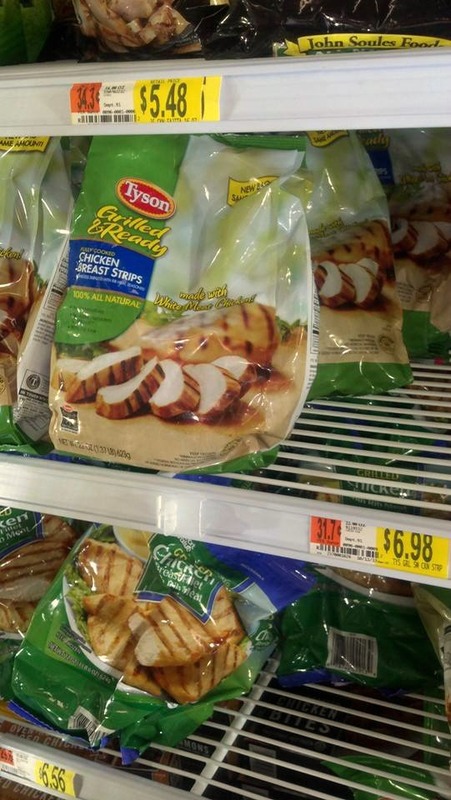 Walmart currently has all Tyson Grilled & Ready Chicken products on Rollback for just $5.87. 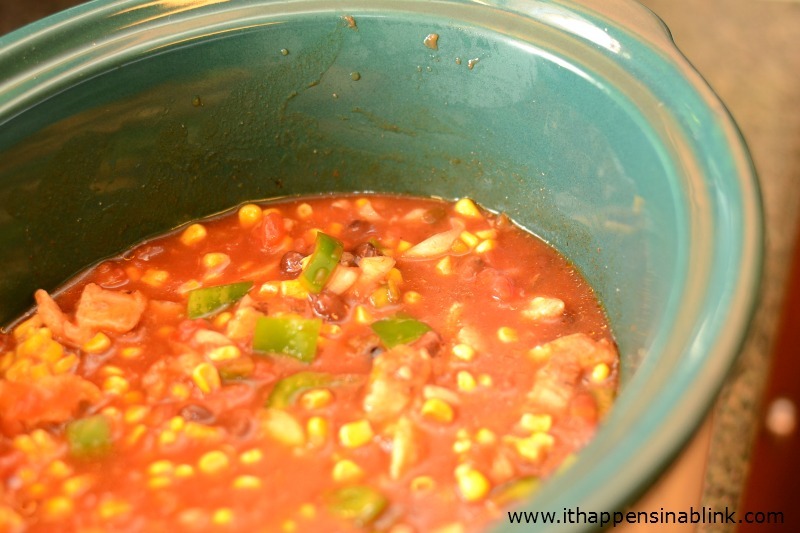 This soup is packed with veggies: peppers, onions, tomatoes, and green chilis. Feel free to add any other vegetables as you like. Chose the lightest versions of all other ingredients to keep the soup lean and mean. I did use a small can of black beans in my soup, per the hubby’s request. If it had only been me, I would have skipped the beans. The recipe in itself is so easy– thanks in part to the pre-cooked chicken strips. Simply add the ingredients to the slow cooker and done! Pour 1 tablespoon olive oil on bottom of slow cooker. 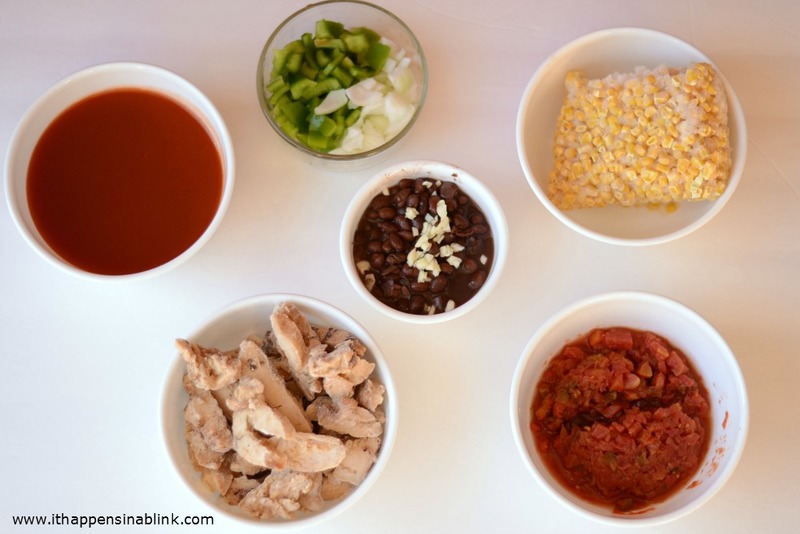 Add pepper, onion, tomatoes, enchilada sauce, chicken broth, (frozen corn and beans, if desired) and chicken strips to slow cooker. Stir to combine. Season with a sprinkle of salt, a sprinkle of pepper, and the garlic salt. Stir to combine. Cook on high for 3 hours or on low for 5-6 hours. 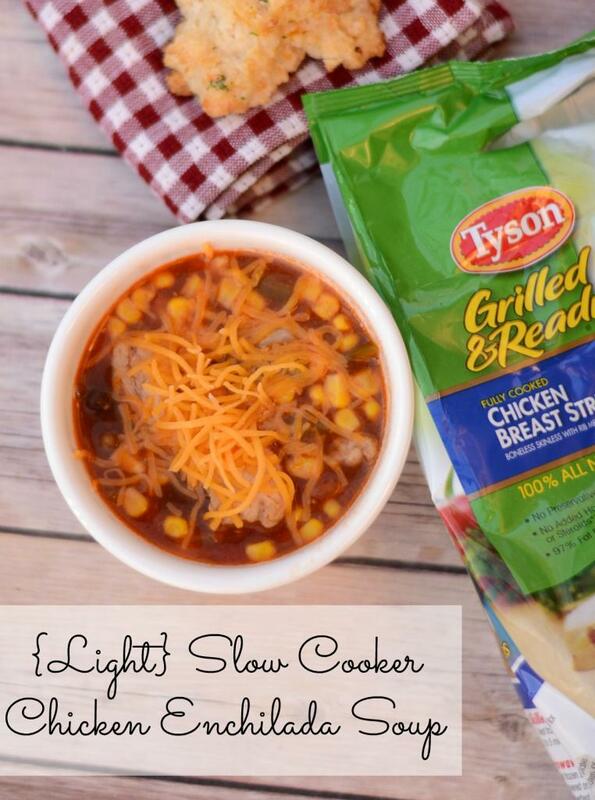 Are you ready to try out Tyson Grilled & Ready Chicken for all your slow cooker needs? There will be in-store demos for Tyson Grilled & Ready products happening in select Walmart stores from January 16-19 in addition to a super fridge that will be in 1,067 stores. To see more easy and healthy additions to your everyday routines, visit the “Just Add This” Grilled & Ready Facebook Tab. From January to March, fans will enjoy recipes, tips, and weekly prizes. Foods packed with protein helps me to stay fuller longer, and Tyson makes it easy to get enough protein in my meals throughout the day. For up-to-date information, follow Tyson on Twitter. For more mouth-watering recipes, see the Just Add This Pinterest board! And be sure to RSVP to join the #JustAddThis Twitter Party this week on 1/9/13 at 1:00 pm. We use those grilled chicken strips all the time…on pizza, in salads…yum! I love the Tyson Grilled and Ready products and use them ALL.THE.TIME. I especially love using them when I’m the only one at home and need something easy, but healthy just for myself. It’s so much better than heating up the oven for just me! Melanie, this is the perfect soup for such a cold day AND the Tyson chicken strips make it a snap to make! Thanks so much for sharing this great recipe today! Yum! This looks delish! I’ll have to pin it for later! I think I just found what I’m making for tomorrow’s dinner! Love crock pot recipes. Thanks for sharing! YUM! 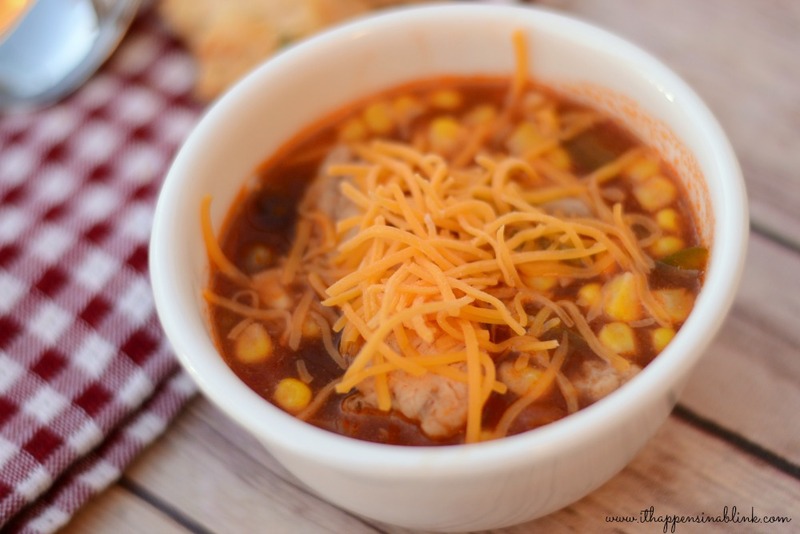 Chicken Enchilada Soup is one of my favorites! I’m going to have to try your version! Mmm, I want that for lunch! I know- talk about saving a step! Tyson makes cooking easy! I love dinners that are easy, have lots of protein, and have leftovers for the next day! This look absolutely perfect! It is great for these cold days! 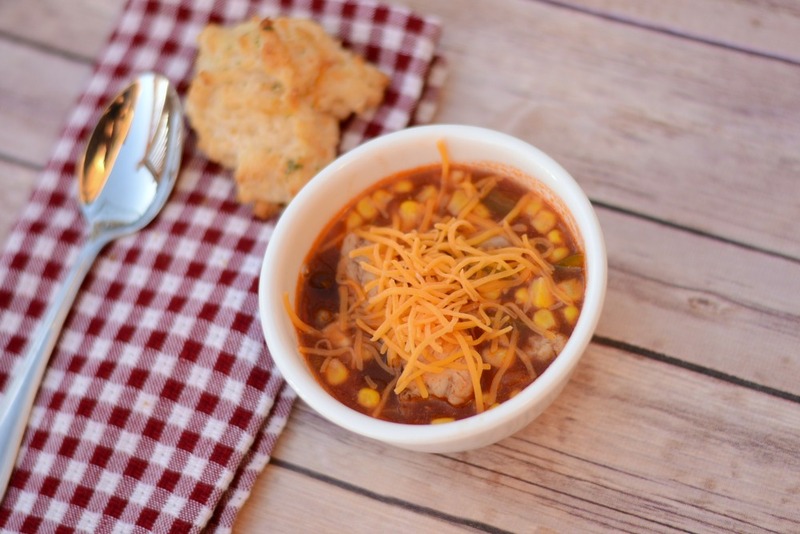 Thank you so much for sharing this recipe, I can’t get enough of slow cooker meals! You are a genius!!! I never thought to use these in my chicken chili! Also this soup looks fab!! This looks relish, and so easy to make! That looks FABULOUS. I need easy. Thanks for sharing!! My slow cooker cooks overtime on a daily basis. Why do I not buy “ready” things like this more often?! I really need to- would prevent the tizzy I seem to have trying to figure out dinner every night :/ This chicken looks awesome! Yes, you can add it to so many things! Yum! Can’t wait to try this recipe. It sounds delicious!! It has a nice kick to it, too! I know. We use their products so much at our house. Thanks for stopping by, Kristin! What would be the equivalent in boneless-skinless chicken breast? My budget doesn’t allow for prepared chicken. That would be 2-3 boneless skinless chicken breast.